Emily's 2nd day of Kindergarden!! Emily had an amazing first week of school. All of the students were really good with her and she wanted to go back everyday. We are so happy that she enjoyed her first week of school. We are so thankful that Emily is in such a great place with great kids and such a loving teacher. Brianna on the other hand, had a hard time at school this week. It was new for her, and new to be around a lot of kids that she isn't used to being around and just adjusting to not having a binky. We are thankful that she is in a good place and they are working with her. We know it will take her some time and she will get used to it. Jessie is doing well in 5th grade. She has more homework this year, but to be expected with 5th grade. Overall this past week, was a great week and the girls did really well. 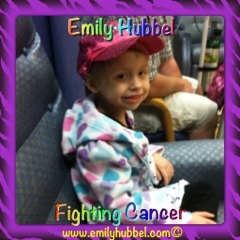 We explained to Emily tonight that this week she would be in clinic all week for another round of chemo. "I thought I was done with chemo!" We explained to her we thought she was done too and how she has 3 spots left and we need to get rid of them. Emily took the news well and we told her how proud we are of her for being such a good girl. Earlier this week, we heard some awesome news from Dr. Sholler. Dr. Sholler received approval from National Cancer Institute that Emily is eligible to receive CH14.18 compassionate use with an Echo and Pulmonary Function Test. These two tests need to be completed and sent over and hopefully can start CH14.18 within a month. So, Emily will do another round of the Nifurtimox trial, 4 days of chemo with the Zometa, Day 5 Neulasta shot and then 3 weeks after the chemo, we will head back to Helen DeVos for scans to get ready to start Antibodies. We are so happy that Emily was approved for compassionate use of the antibodies, this has been our goal to get Emily to antibodies. 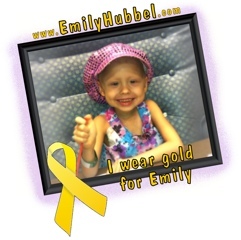 After antibodies, we will have Emily on the DFMO trial that Dr. Sholler has, but that is to talk about when we get there. We are hopeful that with this round of chemo that her counts do not drop below 500 because if they do, she will not be able to go to school. It is likely that they will drop, but we will still remain hopeful. We did explain that to her, but we will see how things go. It has been absolutely amazing not seeing Emily laying on the couch these past few weeks, Dad and I have seen Emily run and play, laughing and having a good time. It has been amazing and watching the energy she has. Yesterday we spent almost a full day playing outside, and the girls running and having a good time, and it was great to be outside with them and let them have fun (besides worrying about the West Nile). We didn't think she would make full days at school this past week, but we did and we are just so amazed that she did so well. Emily had her PFT on Friday, which was quite interesting, but she did pretty well with it. We learned that Emily is 30 pounds, that is right, she is 30 pounds. She hasn't been 30 pounds since diagnosis back in December of 2010, so we are hopeful that we can keep this weight up. So, please send all your positive thoughts that this round of chemo knocks out the 3 spots left and that Emily handles this round well. We also want to continue to thank all of the amazing people out there who continue to think of Emily and our family and for sending your thoughts and love to us, they mean so much to us. Thank you again for all that you do. Good night. 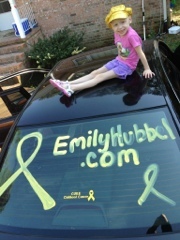 We will keep you up to date on how Emily is doing this week on the 7th round of the Nifurtimox Trial. Remember to hug and kiss your kids and tell them how much you love them. 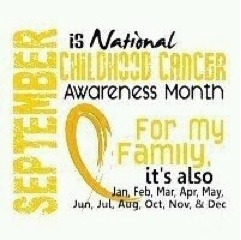 September is Childhood Cancer Awareness Month, spread the awareness. Its been pretty quiet here since the last update. 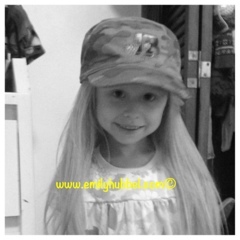 Emily has had clinic visits twice a week, which has consisted of platelets and blood. She hasn't really complained since earlier this week about her toes bothering her, so hopefully that side effect has gone away. Her weight continues to go up and she is eating great, she is up to 28.1 lbs. We have lots of "News", meaning a lot of new things coming into our future. Monday we got her registered for Kindergarden. Wow, did I say kindergarden?? It is so hard to believe that Emily will be starting kindergarden and Jessie will be in 5th grade and Brianna will be starting daycare. Like I said we got her registered and was even so awesome that the day I went to register her, I was able to meet her teacher, Mrs. Tetlow. Mrs. Tetlow is a 8 year cancer survivor so talking with her about Emily so very much understood what we were going through. Emily is signed up for homebound so that when she is not able to be at school due to treatment, she will have a teacher come to the house or we will work something else out. Emily and Mrs Tetlow. She was reading to Emily. Thursday and Friday they were doing orientations for the kids. 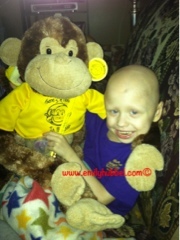 Emily wasn't able to go and Jessie did go and meet her teacher on Friday. Mrs Tetlow was pretty amazing to wait around to meet us on Thursday afternoon after everyone was gone (at 430) to meet with Emily and to be able to meet Doug. 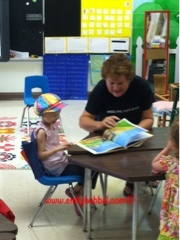 Mrs. Tetlow is great with Emily and we feel very comfortable having her. She will let Emily make the calls and they won't use the clinic because of germs. She said she did talk to Jessie's 5th grade teacher in the case that Emily does ask for her. Also while Emily is not in school, we have brought a Monkey to Mrs. Tetlow, called Monkey in My Chair, so the students will know that they have another student and her name and the monkey will go with the class where ever the others students are. Mrs. Tetlow also met with with the Education Liason from VCU and she is working to make sure she comes and talks to the students about Emily and we will write a letter that will go home to the parents on the same day that will help the parents to talk to the kids with their questions. So I want to also open this up that if any of the parents have any questions at all, to please let us know. Emily seems to be excited about school, but we know she may not make it the full day and if she doesn't that is ok.
School actually starts Tuesday, and honestly I can't believe that Emily will be starting school soon. I know I will cry as I can see Doug having some tears about it too, I to have cried every year that Jessie has gone off to the next grade. I have every year taken Jessie on her first day of school, and this year will be the first year that I won't be able to since Emily has clinic,, which bothers me. But it isn't like us to not do something another time, a date is just a date. 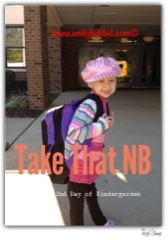 So we will celebrate the next week as the first day as we will with Emily for kindergarden and Brianna for daycare. Brianna starting daycare the same day as well, will be hard on us and this will be the first time she has ever been in a setting like this. We really want to thank CCDC for all that they have done and that they will be working with Brianna. We are so thankful that Brianna's teacher will be Mrs. Robin, whom was Emily's first teacher there as well. Lots of new things to be happening here soon, so it will be a lot to take in and adjust to. On the medical front, next week we head to Michigan for end of trial re-evalution scans and bone marrow. We did learn that Wings of Mercy will be able to work with us and get us a flight there by the pilot from the previous times and a different pilot to get us back. So we are very thankful to have a flight and get that taken care of.and to also have a car while we are there. We would have drove if we needed to, but there is still possibiities we could be traveling for future treatment, because we are really not sure where we will end up. We are having the doctors working on seeing about antibodies because that is our goal. Don't forget it is September, and it is childhood cancer awareness month, lets continue to spread the awareness like we have the rest of year. We need to make everyone aware.